An encounter with Steve Abrahams. Many Northants cyclists will know Frank’s slide shows. Here’s his encounter with Steve Abraham. Most people in the world of cycling will have heard of Steve Abrahams by now. He set off on January 1st to break the annual mileage record set by Tommy Godwin in 1939 of 75,065 miles. Spring has sprung! Well at least that’s what it felt like as the five off us set out for a brisk ride out towards Castlethorpe and Haversham. There were plenty of other riders out as well – mostly in ones and twos but that’s a good sign as well. It was surprisingly breezy as we battled our way back to Salcey – why is it that the wind always seems to be against you when out cycling?!! But we could almost ‘smell’ the coffee a few miles out. So over a pleasant coffee stop at Salcey it was good to recognize a fair few other cyclists and do some ‘catching up’ in the sunshine. Good to ride with you guys! We took on the Sulley Challenge today and had a good time despite exceptionally blustery winds on a delightful and generally quiet route. The Challenge ride is an audax-style, self-navigated route, with GPX files available for those with satnavs. The ride starts and finishes in Lutterworth with a choice of 70 km or 100 km routes. The longer route was out towards Great Easton, north to Tilton-on-the-Hill, through Rutland and back via Kibworth. A total of 66 riders were registered, most setting off in twos and small groups. 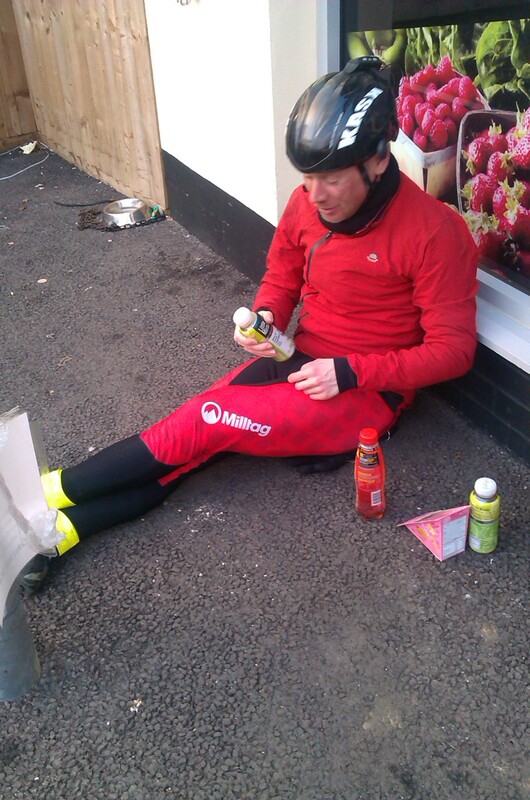 Brian and I set off together and had such a good chat that we missed our turn in Walton, hence doing an extra mile. We said goodbye in Great Easton where Brian followed the 70 km route and I stayed on the 100 km. Brian stopped at the Neville Café along with fifteen cyclists from Rugby Velo and three Lutterworth cyclists doing the 70 km route. I met a chap who was regretting choosing a fixie! Both of us faced a return route to Kibworth directly into the wind – in open countryside with little to stop the wind – making it sometimes hard to control the bike. Average speeds fell significantly. However we both got back before any serious rain. You can see my route here. Perhaps next year more people will be tempted to join this low-cost enjoyable event. A organiser’s report is here.